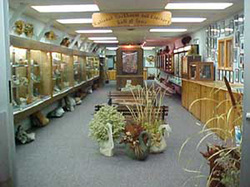 The National Rockhound and Lapidary Hall of Fame was founded by June Culp Zeitner in 1987 to recognize excellence in the earth sciences by inducting one or more persons each year in six categories: Minerals, Fossils, Metal Craft, Lapidary, Education and Tribute (Deceased). At this time we have inductees representing 33 states. All of the inductees are experts in their fields. Many of them have published several books and most of them have been active in community service. • Washington Roebling, one of our inductees in the Tribute category, was best known for designing the Brooklyn Bridge in New York City. He had an extensive mineral collection that was given to the Smithsonian Institution. • Lafayette Funk, a member of the family that hybridized a type of corn (Funk's G Hybrid), collected giant mineral specimens. Lafayette donated his first collection of enormous minerals to Illinois State University at Normal. Later collections were donated to Wesleyan University and the University of Illinois at Champaign. Originally inducted in the Minerals category, he is now deceased. • Also in this category Joseph Lizzaddro, collector of lapidary masterpieces, established the Lizzadro Museum of Lapidary Arts in Elmhurst, Illinois. • A Lapidary inductee, Ute Bernhardt was the first American and the first woman to carve the official cameo of the Pope. She lived in the Vatican for the six weeks it took to carve the cameo. • Roger van Cleef, an inductee in the Fossil category, played football for the Dallas Cowboys. • In the Mineral category, Paul Desautels was curator of Minerals at the Smithsonian until his retirement. Paul also served on the Board of Consultants for the Hall of Fame. He is now deceased. • Bob Jones, Sr. Editor of Rock & Gem Magazine, author and frequent speaker at gem and mineral clubs and shows was inducted in the Mineral category. The Hall of Fame is governed by a seven member Board of Consultants composed of one person from each of the American Federation of Mineralogical Societies member regions. The names and federations of the Consultants are as follows: Pat LaRue, California; Marge Collins, Midwest; Leslie Wayment, Southeast; Richard Jaeger, Rocky Mountain; Hidemi Kira, Northwest; Emerson Tucker, South Central; and Steve Weinberger, Eastern, Chairman.